The intentionality required to complete the devotional is well worth it. Please consider joining us as we prepare our hearts for the most amazing time of year, Easter! You can download a PDF of the devotional here. Come celebrate the birth of our Savior with a candlelight Christmas Eve service. We will gather at Woodmen Hills Elementary School from 5:00-6:00 to sing, read, and spend time in community. We will have a hot cocoa bar and a special presentation from missio: Kids! Visitors and family members are certainly welcome! Hope to see you there! 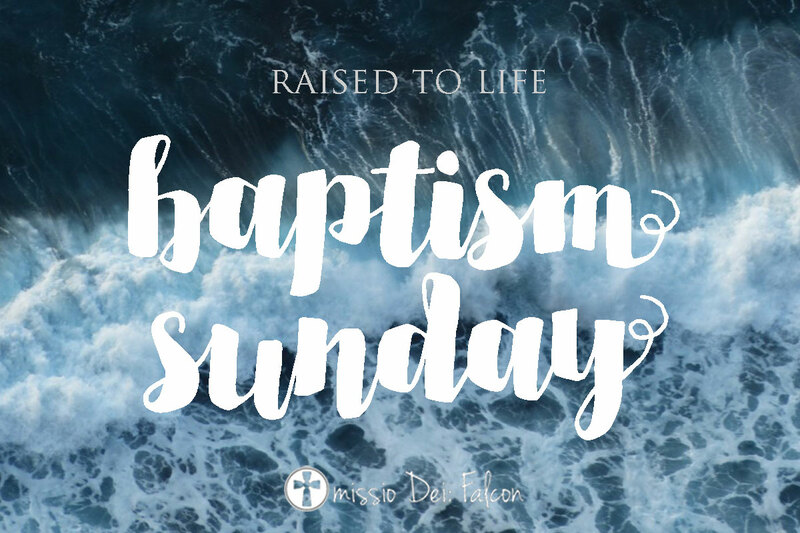 Here’s your weekly newsletter from missio Dei: Falcon! This is our attempt to keep everyone updated on important happenings around our church. This year we are participating in the toy drive for Operation Christmas Child as a way to show Jesus’ love to children in need. This Saturday is the second to last week we will be collecting items for the shoebox drive, so make sure to bring your donations to church Saturday! For more info on what to bring click here. Every Saturday we gather at 5:30 to pray for the upcoming service. This time is open to anyone who wishes to come pray corporately for the church. We’d love to see you there! When you shop on Amazon you can support missio Dei: Falcon! Simply shop through “smile.Amazon.com” and list missio Dei: Falcon as your charity. Amazon will then donate .5% of all your purchases to our church. 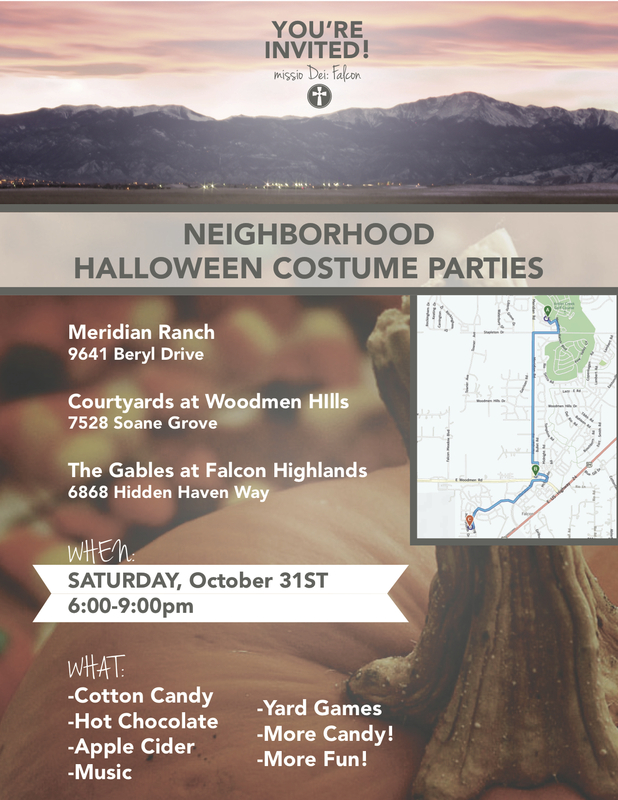 We are using Halloween as a missional opportunity for our church to get into the neighborhoods of Falcon. 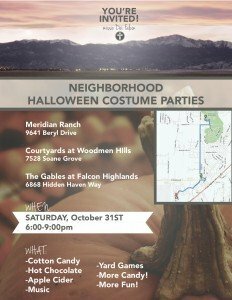 Instead of our regular service we will host a party in each of the following neighborhoods: Meridian Ranch, Courtyards at Woodmen Hills, and The Gables at Falcon Highlands. We would love to see everyone participating in this missional opportunity, so please talk to Kolburt if you are interested in serving. Oh yeah, and costumes are not required but strongly encouraged! Halloween (Reformation Day) Costume Parties! The festivities begin at 6:00, and there will be cotton candy, hot chocolate, apple cider, music, yard games, and a atmosphere of fun! Bring a friend and come celebrate Reformation Day (Or Halloween) with us! https://www.missiodeifalcon.org/wp-content/uploads/2015/10/Halloween-2015-event-facebook-header.jpg 614 1633 Kolburt Schultz https://www.missiodeifalcon.org/wp-content/uploads/2019/02/missio-dei-falcon-logo-2019.jpg Kolburt Schultz2015-10-20 14:53:462015-10-20 14:59:05Halloween (Reformation Day) Costume Parties! 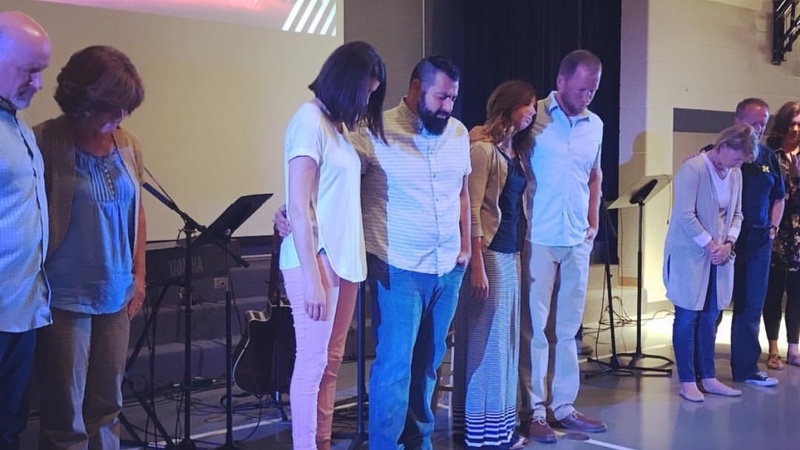 As a church we have always sought to be a place that is prayerfully dependent upon God. To that end, we are opening up a pre-service time of prayer for anyone and everyone who is interested in seeking God and asking for His blessing upon the upcoming worship gathering. So, every Saturday whoever is available will gather at 5:30 in the gym to pray over the church service. We would love to see you there! The mission of every Christian is to be a disciple of Jesus who makes disciples of Jesus. Unfortunately, the term “discipleship” has come to be associated, in many Christian’s minds, with an optional activity that only certain A-team Christians engage in. The reality, however, is that if you are a follower of Jesus you are a disciple called to make more disciples. The question, though, is how well are we doing at this task? Wow, that sounds offensive! You bet, because we’re men and we like to be challenged, right?! Men need a cause to fight for, and without a worthy cause we become passive, lazy, and lethargic. Satan is pretty good at convincing us that pursuing pleasure is more important than pursuing holiness, that Bible studies are something our wives do, and that if we talk about our faith at work we’ll look like a gigantic weirdo. Meanwhile, God is using, and has always used, men who are aware of their weakness before Him to make a difference in their families, communities, and workplaces. This uncharacteristically abrasive email is hopefully a challenge for all of us to be those men, not the boys who leave the work of discipleship to their wives worried that Jesus might ask us to be less obsessed with football and more obsessed with Him. The reason you are receiving this email is because I know that you are up for the challenge! We’re calling this morning gathering Boot Camp, because we want to make sure we realize that this training is for the spiritual war we are in, and because those of us who haven’t gone through a real boot camp like to use the phrase to make us feel more masculine than we really are (to all our service men, I sincerely apologize). By signing up for Boot Camp we are committing to a 15 week (8 morning meetings) process where we will read a chapter of the Bible everyday, study in depth the book of Titus to see how it challenges and equips us, commit to praying missionally every day, and look for opportunities to take what we are learning and disciple others. So if this sounds like something you want to sign up for just let me know by responding to this email or calling me (719.216.2612). I firmly believe that this could be a catalyzing time for us as men and as a church, and am excited to see what God does through those who are humble enough to seek Him and hard working enough to make it a priority. Feel free to pass this on to anyone else outside of our church who may be interested.